Hi everyone! I am so excited to be partnering with The Twinery and Imaginisce for this super fun blog hop!!! 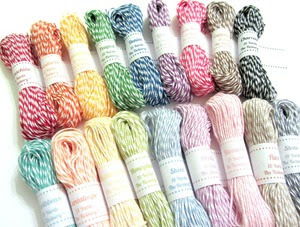 The Twinery sent us all their newest colors to create and play with and trust me, I've been using it on anything and everything (just take a peek at any of my recent projects in my previous posts)! For today's hop, I pulled out my Imaginisce Animal Crackers collection and my i-top to create this fun little birthday card. To make the card, I simply adhered pattern paper to the bottom half of the card, large enough for my little alligator die-cut to pop off of. Then I used my i-top 2.0 and made birthday "balloon" using the small (16mm) and medium (22mm) brad daddies. Before attaching them to the card, I tied the twine to the brad points in the back to keep the twine in place. Then I attached them to the card and added a bit more twine to ensure they looked like balloons. I tied the twine around the gators tail. Lastly, I fussy cut the banner from the animal crackers paper, added some whimsy twine and added a "celebrate" sentiment. Oh and I HAD to add a bit if glam to the bottom with my i-rock/glam rocks. Now I just need someone to have a birthday!!! Now, on to the rest of the hop...the hop will continue all week and we'll be showcasing members from each of the talented teams all week and of course, there will be prizes to be won!! Imaginisce - start here if you are just beginning the blog hop! Heather Leopard <-- That's Me! Wanna see what prizes that are up for grabs??? This is what they sent me! Imagine the fun you will have! The deadline for leaving comments is 11:59 EDT, Sunday April 22. Winners will be announced by The Twinery and Imaginisce on Monday, April 23rd. The i-top balloons are too cute! VERY CUTE card!! LOVE the balloons! Love all the pops of colors! Everything about this card is too cute! So a cute idea!!! I have not yet used twine so i'm really looking forward to this week as the blogs I've visited this morning are really inspiring! Thanks for sharing. oh my, i just love love the balloons. thanks for sharing the great idea! This card is just TOO cute! LOVE how you used the i-top to create the balloons and the twine for the banner and balloon strings. So clever! Genius - making the balloons so they pop off the page! Love your card. Love the accents on the card! Could that be any cuter? I think not. Love the Animal Crackers collection. Love it, toooo.... cute. Thank you for sharing. Great card - using the brads as balloons is a fabulous idea. Heather...this card is simply adorable! Great use of the twine and the brad daddies...love it! This is so cute! Love how you made the balloons. Ok I really need to purchase me an I top, love this look with the twine, super cute!! Cute card!!! I am in LOVE with the balloons!! Cute card. The balloons are amazing. Cute card, of course the banner, but the balloons are exceptional. Love the alligator card, love love love! Fun & festive card, Heather! Love it! Love the itop balloons tied with twine! Oh my gosh, this is so sweet. Uh, my birthday was in March- I might be a bit old for the card but I would gratiously accept it. LOL!. Love how you paired the two products. Fun card, adorable how you used the twine! your card are soooo cute. Heather ~ I absolutely ADORE what you did with this card using our baker's twine! What a great design. I'm so happy to be on the hop with you! The balloons are awesome - I'm going to have to try that idea! super cute card heather! LOVE the brad balloons!! Love this. Looks like lots of fun! Very fun birthday card--I like the banner and the balloons you made. How supper cute this is. love the crock and the Balloons are a supper Idea. Love the little banner and the Twine is great. thanks for sharing. and for the chance to win. Super cute card! Love the 'balloons' on it. Awesome card! I love those itop balloons with the twine :) Great idea. Thanks for sharing! I am loving the custom brads as balloons! Brilliant! your card is so cute! thanks for sharing it!!! Clever and fun idea Heather!!!! What a fun week we are going to have! Hope to win! Those balloons are so cute! Thank you for sharing. I love the balloon I-top idea - I will so be using this! So cute. So happy !! I love that you used the Itop to make balloons! Fantastic card! Wow! Your card is amazing! If I say my birthday is soon will you send it to me? Hee Hee. I LOVE how you used the itop for the balloons. Great job! Thanks for sharing! Fabulous hop! Thanks for the inspiration! Cute card. I love the balloons! Thanks for sharing! I love the balloons. Great card! Cute card! 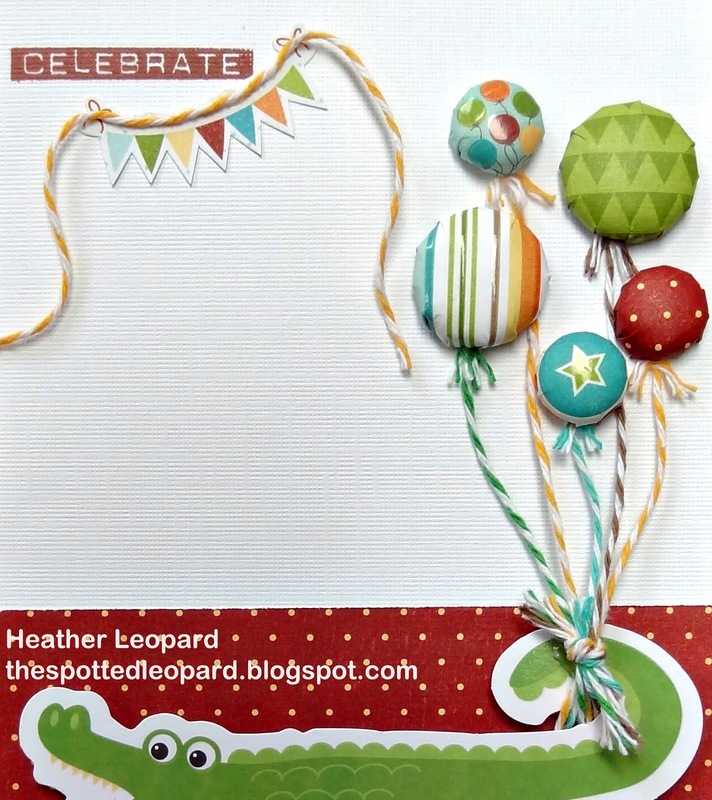 Love the balloons and the alligator! Thanks for sharing such a cute card.Love the balloons on the card. Great job. Oh my goodness this card is all of Yummy! Love this gator and the twine strings for the balloons! So cute! Love the idea of the balloons! How awesome is this card!!!!! I'm loving the simplicity of it. Classic yet fun. So simple and yet so much fun. Who can resist baloons? This card is adorable! 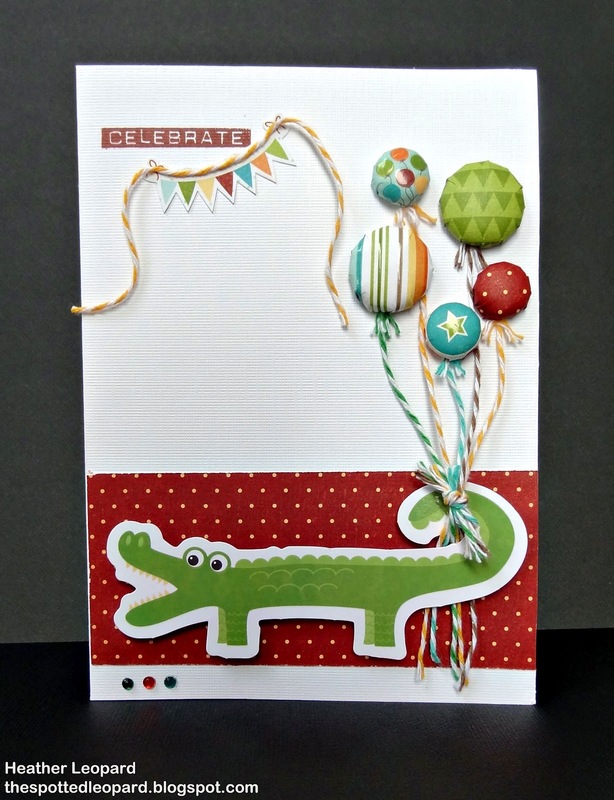 I love how you used the twine as balloon strings coming off the alligator's tail...too cute! Darling card with the twine and I-top balloons! Love this card! it is uber cute! I love those I-top balloons! such a cute card! love the crocodile with the colorful balloons you made. Super cute card! Love all of the different colors for the balloons! This is soo cute!!!. Love the balloons you created. Simply adore the balloons tied with The Twinery twine! Too cute. Your card is so darn cute...love the energy that loopy twine gives! That card is so adorable, love the balloons and the banner, the way you used the twine and papers together is great. What a cute card!! Love your use of the bakers twine from The Twinery. I love the idea with the balloons! Hee hee so cute! Love it! Soooooo cute!! LOVING how you did the balloons and the twine!!! Love your card. It is so cute. Thanks for sharing it with us. Awesome card!! Thanks for sharing in the blog hop!! Adorable balloons and love they are tied to the alligator with twine. I dream of twine and love to Make Waves so these prizes are perfect for me. Great paper choices! oh my gosh, balloons, i die. Adorable balloons! I love the banner as well. Heather this card is adorable! Love the bright colors! Great card! I love the brad balloons with the twine strings! So happy! !